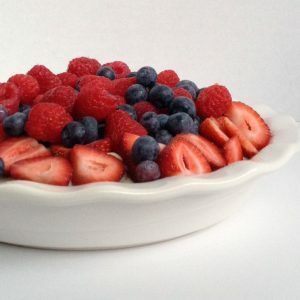 An easy and delicious fresh mixed berry tart atop homemade vanilla cream you can make ahead of time, that's perfect for a birthday party or potluck with friends! Make the sugar cookie dough mix into a round pizza shape and bake it according to instructions on parchment paper and set aside to cool. Clean all of the berries, wash, stem and slice the strawberries if they are really large. In a medium saucepan, whisk the milk, sugar and cornstarch over medium heat, cooking just until the milk scalds - you will see bubbles around the edge. Add about 3 tbsp. of the milk mixture into the eggs, and whisk lightly. Next pour the egg mixture slowly into the milk mixture, stirring with the whisk constantly and immediately return to the heat. Keep stirring until the cream starts to thicken and bubbles slightly - but not boiling. Let cool slightly and put the vanilla in a large bowl to cool, covering it with plastic wrap and letting the plastic film onto the top of the cream. Once cooled, spread the vanilla cream over all of the sugar cookie dough base, and mound it slightly in the middle. Decorate with the mixed berries as you wish. I started with the sliced strawberries around the edge and then filled in with blueberries and finished with the raspberries and any leftover strawberries. Cover and chill for 2-3 hours before serving. Using a sharp knife, slice your tart into lovely pie wedges, and garnish with freshly whipped cream.